A US military panel has recommended a marine be involuntarily discharged after he was pictured at an anti-war protest dressed in desert fatigues. 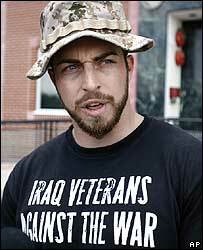 Marine Corporal Adam Kokesh was accused of misconduct. The military bans the unauthorised wearing of uniforms. But the 25-year-old insisted that as his name tag and military emblems were removed he had done nothing wrong. The three-person board said Cpl Kokesh should lose the honourable discharge status he had already been granted. Cpl Kokesh, a member of Iraq Veterans Against the War, appeared at the Washington demonstration in March. Investigators recommended he be discharged under "other-than-honourable" conditions, but the panel opted for a middle road, meaning he would keep all of his benefits. "This is a non-punitive discharge," Colonel Patrick McCarthy, chief of staff for the mobilisation command, said. "What that means is he is not dishonourable, and he's only kind of honourable, so in effect, the board picked the safe route," Cpl Kokesh's lawyer Mike Lebowitz said. Marine Captain Jeremy Sibert, speaking at the hearing, said military personnel can be punished if their civilian behaviour "directly affects the performance of military duties and is service-related". The protest was held to mark the fourth anniversary of the 2003 invasion of Iraq. Cpl Kokesh said he would appeal against the board's recommendation. "I'm standing on principle and we're going to contest this on principle. It's not going to go away," he said. "It's clear these tactics of intimidation are being used against members of Iraq Veterans Against the War. "Freedom of speech means the right to say what other people don't want to hear." Cpl Kokesh is a member of the Individual Ready Reserve, a body consisting of people who have left active service but still have to fulfil the remainder of their eight-year military obligations and can be called back to duty. His service was due to end on 18 June this year. The board's recommendation will be submitted for a final decision to the Marine Corps Mobilization Command in Kansas City.